Have you recently written a paper, but you're not sure to which journal you should submit it? Or maybe you want to find relevant articles to cite in your paper? Or are you an editor, and do you need to find reviewers for a particular paper? Just enter the title and/or abstract of the paper in the box, and click on 'Find journals', 'Find authors' or 'Find Articles'. e-Journal Kopertais Wilayah 1 DKI Jakarta will then compare your document to millions of documents in PubMed to find the best matching journals, authors or articles. e-Journal Kopertais Wilayah 1 DKI Jakarta relies on the data in PubMed, which can contain papers from predatory journals, and therefore these journals can appear in e-Journal Kopertais Wilayah 1 DKI Jakarta results. 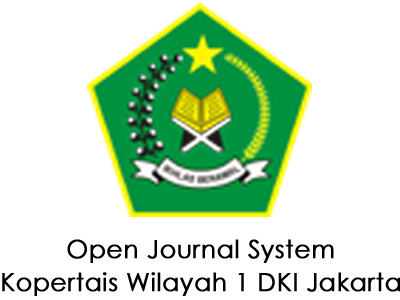 To help identify high-quality journals, e-Journal Kopertais Wilayah 1 DKI Jakarta now tags journals that are currently indexed, and open access journals approved by the Directory of Open Access Journals (DOAJ). Since 2018, The Islamic Studies Journal (AL-AQIDAH) is a Peer Reviewed, Open Access International Journal. Notably, it is a Referred, Highly Indexed, Monthly, Online International Journal with High Impact. The Islamic Studies Journal (AL-AQIDAH) is published as a Monthly Journal with 10 issues per year. We also assist International and National Conference to publish their conference papers. The Islamic Studies Journal (AL-AQIDAH) covers all disciplines including Islamic Studies. The Islamic Studies Journal (AL-AQIDAH) always strives to be a platform for Academicians, new Researchers, Authors, Engineers and Technocrats and Engineering Scholars. Since inception, The Islamic Studies Journal (AL-AQIDAH) is continuously publishing original and best quality research articles. The journal of the study of the Qur'an and Islamic (Mumtaz) ISSN Print: 2087-8125 is a peer-reviewed, scientific journal published by Graduate Program Institut PTIQ Jakarta. The aim of this journal is to publish high-quality articles dedicated to all aspects of the latest outstanding developments in the field of Islam and Muslim society. Its scope encompasses science of the Qur'an, Hadist, and Islamic. It was first published in 2015. It published two times a year. Journal Kordinat (Journal of Communication Between Islamic Colleges) is (p-ISSN:1411-6154, e-ISSN: 2654-8038) is scientific, peer-reviewed and open access journal managed and published by Kopertais Region I DKI Jakarta. Published two times a year since 2016, is a bilingual (Indonesian and Arabic), peer-reviewed journal, and specializes in Indonesian Islamic studies and Southeast Asian Islamic studies in general. All submitted papers are subject to double-blind review process. Click here to get the information about author guidelines, has registered as a CrossRef member. Therefore, all published articles will have a unique Digital Object Identifier (DOI) number. Journal kordinat provides immediate open access to its content on the principle that making research freely available to the public supports a greater global exchange of knowledge. Journal Kordinat (Journal of Communication between Islamic Colleges) is an open access journal and peer-reviewed that publishes either original article or reviews. This journal focuses on islamic study. Journal Islamic Education (IQ) (ISSN 2338-4131) is a peer-reviewed journal published by Faculty of Tarbiyah Institute of PTIQ Jakarta. This statement clarifies ethical behaviour of all parties involved in the act of publishing an article in this journal, including the author, the chief editor, the Editorial Board, the peer-reviewer­­­­­ and the publisher. This statement is based on COPE’s Best Practice Guidelines for Journal Editors. All submitted papers are subject to double-blind review process. Click here to get the information about author guidelines, has registered as a CrossRef member. Therefore, all published articles will have a unique Digital Object Identifier (DOI) number. Journal Islamic Education (IQ) provides immediate open access to its content on the principle that making research freely available to the public supports a greater global exchange of knowledge. Journal Islamic Education (IQ) is an open access journal and peer-reviewed that publishes either original article or reviews. This journal focuses on islamic studies, islamic education, and science of the Qur'an.